Kanyakumari, fondly called as Kumari Mavataam by the Tamil people is literally located in the southernmost corner of the Tamil Nadu state. Even though the natural geographic characteristics of the territorial dominion are unique, Kanyakumari feature excellent transportation system and facilities. The district is considerably connected with the rest of the cities and towns of Tamil Nadu and other states across the nation. Also, it is important to mention that for a district like Kanyakumari that receives visitors from all over the world, irrespective of the seasons for the never ending list of tourist attractions, good transportation system is a key to economic growth and tourism industry. 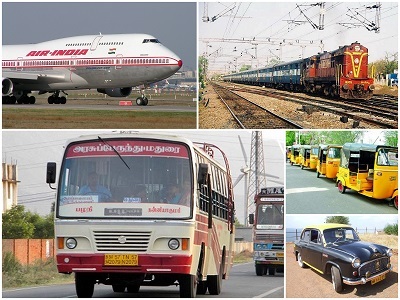 Kanyakumari district has developed its transportation system like facilities, roads, railway lines and other means over the years and today the district is one among the region in the state that feature first-class connectivity options. The district of Kanyakumari is substantially connected by Air, Rail and Road. Kanyakumari not just feature excellent local transportation network to move around within the district limits, but also has fantastic facilities to connect with other cities and states. Kanyakumari district has a road network that comprises of National Highways (NH), State Highways (SH), District Roads and Rural Roads. The most important route of Chennai-Kanyakumari Highway links the Kanyakumari-Trivandrum route near Aralvoimozhi/Aramboly (a Panchayat town in Kanyakumari district) which passes across Nagercoil/Nagerkovil adjoining other significant cities and town finally ends at Thiruvananthapuram in Kerala extending a length of almost 63 km from Aramboly to Kerala borderline. The highroad/trunk road from Chennai to Nagerkovil connects the Kanyakumari-Thiruvananthapuram route near Aramboly and passes across a lot of important cities and towns before proceeding into Kerala. Also, the route from Kanyakumari to Thiruvananthapuram is considered as one of the busiest routes in the country. Roads connecting Kanyakumari district and Thiruvananthapuram metropolis thru Nagercoil town and Colachel town were the first route to be considered for nationalization. It can be said that road transportation is the most preferred mode of transportation in the district of Kanyakumari. The road transportation system in the district of Kanyakumari is governed by the Tamil Nadu State Transport Corporation, popularly called as TNSTC. 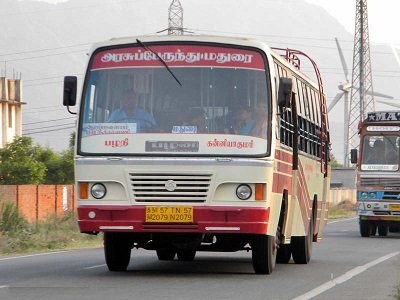 Regular buses are operated from Kanyakumari district to Chennai, Bangalore, Tiruchirappalli, Velankanni, Udhagamandalam, Kodaikanal, Vellore, Salem, Erode, Tirupati and to many other cities and towns of the country. With three fully operational bus stands (bus terminus) that include Central and Express Bus Stand, Christopher Bus Stand and Anna Bus Stand; Kanyakumari district offer no hassle to the local population and tourists to travel within and outside the district. Other than bus services, Kanyakumari has mini buses, taxi cabs and auto rickshaws that are operated all over the district, day-and-night. Kanyakumari district houses four important railway stations in the southern state of Tamil Nadu and they are Kanyakumari railway station (Station code: CAPE), Nagercoil junction railway station (Station code: NCJ), Kulitthurai (Marthandam) railway station (Station code: KZT) and Eraniel Railway station (Station code: ERL). The Kanyakumari railway division is a division of the Trivandrum railway division. 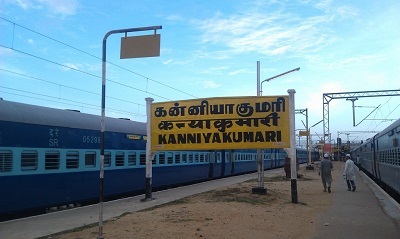 The Kanyakumari railway station is the southernmost railway station in country. The railway line from Dibrugarh to Kanyakumari is presently looked at as the longest railway line route in India. Regular trains are operated to several significant towns and cities across the nation which includes Chennai, Rameswaram, New Delhi, Dibrugarh, Howrah, Mumbai, Bengaluru, Jammu Tawi, Nagercoil, Kollam and so on. Some of the important trains originating from the district of Kanyakumari include Chennai Egmore Kanyakumari SF Express, Rameswaram Kanyakumari SF Express, Thirukkural Superfast Express, Dibrugarh - Trivandrum Central - Kanyakumari Vivek Express, Howrah-Kanyakumari Express, Mumbai CST - Kanniyakumari Jayanti Janata Express, Bangalore - Kanniyakumari (Island) Express, Himsagar Express, Nagercoil Kanyakumari Passenger, Kollam MEMU and so on. Kanyakumari does not have an airport in its administrative boundaries. However, a proposal has been tabled by the Airports Authority of India to construct an airport in Nagercoil town of Kanyakumari district. Situated at a distance of about 88.4 km, the nearest airport to the district of Kanyakumari is the Trivandrum International Airport (IATA: TRV, ICAO: VOTV). The Trivandrum International Airport is well connected with cities like Bengaluru, Mumbai, Kochi, Delhi, Chennai, Goa and many other Gulf countries with regular flights.